I am not so sure about banjos. I don’t care too much for the mechanical five string Bluegrass styles. To my ear they don’t sound very musical, and yet, in the hands of a master like Bela Fleck I am forced to re-evaluate that statement. When he steps outside the Bluegrass box his music is sublime. On another note (pun intended) the Irish adopted the banjo and, being Irish, they changed it by getting rid of the fifth string, tuning it like a mandolin and playing it with a pick. The Irish Tenor Banjo sounds great in Celtic ensembles where it adds punch and drive to the melody line but to hear it practiced solo in one’s basement it sounds frightful. Then there is the the open backed Clawhammer Banjo with the melody floating atop of nice chunking rhythms. It is capable of producing the very best in banjo music. Despite the subversive activities of the Irish the banjo is still the most American of musical instruments. It’s origins may be African but in practice it is absolutely American with a solidly American repertoire. I am so attracted to the sound of the Clawhammer Banjo that I own two and I always have the hope and ambition to one day actually play a tune in the appropriate style. The only thing that puts me off is that I have no real desire to play American tunes. The world does not need another stumbling musician trying to play Old Joe Clark, Cripple Creek or any of the many other standard banjo tunes. So it was nice to come across a video of an Irish tune played on the Clawhammer Banjo. It is a tune composed by Thurlough O’Carolan . For those who don’t know of O’Carolan or his music he was a blind traditional Irish Harper living way back in the late 1600’s. He was a contemporary of Johann Sebastian Bach and he left us with a legacy of many wonderful tunes. They may not have the contrapuntal complexities of a Bach composition but they have a melodic strength that has kept them very much in circulation right up to present times. Acoustic guitar players love O’Carolan tunes and with the introduction of the DADGAD tuning system on the guitar they have adopted O’Carolan tunes with a vengeance. 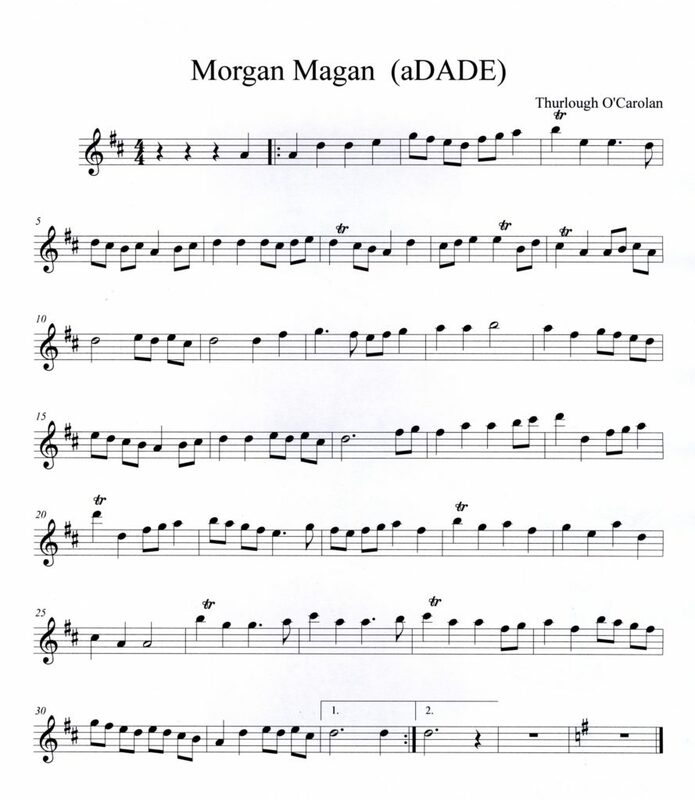 So here it is, Thurlough O’Carolan’s tune Morgan Magan (Morgan Megan) played on the Clawhammer Banjo. For those who maybe interested here is the melody for the tune. I haven’t yet managed to get to grips with playing the tune on the Clawhammer banjo but I suspect it will sit well on a banjo tuned ADADE. It’s another one of those things on my ever lengthening wish list. It just might be that one elusive tune that I am destined to play on the banjo. This entry was posted in MUSIC and tagged Celtic, roots music by Rod Wilson. Bookmark the permalink.